Bollywood sees many proud fathers, many a times. But when it comes to Big B, he is a little extra proud of his daughter and we can see it every time. Be it on his social media timeline or any occasion where his daughter Shweta Nanda Bachchan becomes the achiever. Recently, when she launched her book, Amitabh took to Instagram and was very vocal about his pride. Now we stumbled upon some proof that shows how proud he is. Yesterday, at a charity fashion walk for Abu Jani Sandeep Khosla, Shweta took to the ramp and walked like a princess. 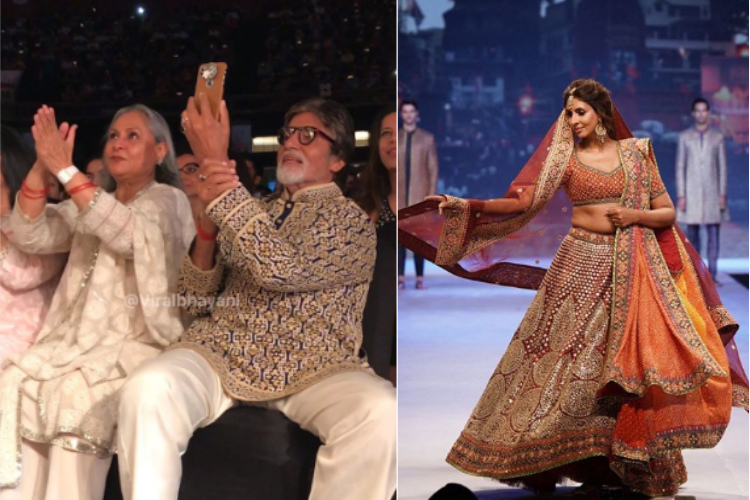 While all the eyes were struck on her, Sonam Kapoor and Karan Johar walking the ramp, dad Amitabh was busy recording the moment on his phone. Sitting on the edge of his seat, with pride filled in his eyes, he even asks people to get aside so that he can capture it all. Reminds us of those dads who see their daughter perform in the school function for the first time. He wrote,"To the best .. always .. tonight elegance grace and dignity "
It's truly heart warming isn't it? Shweta launched a book Paradise Towers and then too Amitabh wrote a post. Arjun Kapoor gets EMOTIONAL; shares a TEARY Note for mom Mona! Yo Yo Honey Singh REVEALS his Plans for this Year!